(CNN) -- A Dolton, Illinois, police officer assigned to a school was placed on administrative leave and later resigned after a surveillance video surfaced of him allegedly assaulting a special-needs student, officials said. Videotape allegedly shows an unidentified police officer assaulting student Marshawn Pitts, 15. Ed Manzke, an attorney who represents the student, Marshawn Pitts, 15, told CNN Wednesday the officer beat Pitts for not adhering to the school's dress code. The incident occurred in May at the Academy for Learning, a Dolton high school for special-needs students. Pitts was admitted to the school in May after moving from Iowa, Manzke said. He suffered brain injuries as a child when he was hit by a car. The police officer, who has not been identified, reprimanded Pitts for not tucking in his shirt as school dress code and policy requires. A video, released to Pitts' parents by the school several weeks after the incident, showed Pitts talking to the officer and a faculty member grabbing Pitts' arm. Pitts pulls away and walks down the hall, with the officer and faculty member close behind. 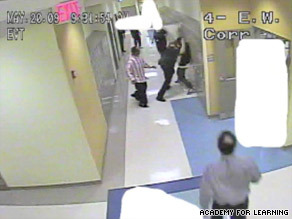 But the officer then slams him against the lockers and pins him on the floor -- breaking his nose, according to Manzke. Pitts was treated by a school nurse after the incident, then taken to the Dolton Police Department, where his mother picked him up, Manzke said. The officer was taken to a hospital and treated for an eye scratch, Manzke said. But, he said, the officer was never charged with anything and an explanation for the incident was never provided. In a written statement, Guy Lindsay, internal information officer for Dolton police, said the department was made aware of the incident and the tape on May 20. After review of the tape, the officer was removed from the school and placed on administrative leave pending the outcome of the investigation, Lindsay said. While on administrative leave, the police officer returned to the department and voluntarily resigned, Lindsay said. The investigation continues, he said. In a statement obtained by CNN affiliate WGN, the Academy for Learning said it could not comment on an incident involving a specific student. But, the school said, "Unfortunately, the physical restraint of a student sometimes becomes necessary. In such instances, AFL and its staff are committed to employing techniques that are safe, effective and which conform to best practice standards. "Annually, a Behavioral Intervention Committee comprised of administrators, staff, union representatives and parents convenes to review restraint procedures. The AFL Behavior Management Team also participates in professional development and training regarding physical restraint on an annual basis. After a physical restraint occurs, the team meets to process, debrief and evaluate the incident and use of a physical restraint. AFL addresses the unauthorized or inappropriate use of a physical restraint, or improper techniques, as necessary, as an internal manner." Pitts' parents are considering litigation against the city of Dolton, the school and Dolton police, Manzke said. He added he is in talks with Dolton police to settle the case. If those talks are not fruitful, Manzke said, a lawsuit could be filed within a few weeks. Pitts is now living with his father and attending another school, Manzke said.